Japanese bathroom design evokes images of serenity and tranquility, coupled with an unhurried bathing ritual aimed at soothing, relaxing and restoring body and mind. The traditional Japanese bath house refers to a public space. 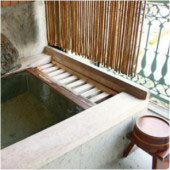 A sentō and onsen refer to a communal bath house in Japan where the onsen has the added distinction that its water comes from a natural hot spring. These baths are strictly for soaking only. Thorough soaping, cleansing and rinsing is done prior to stepping into the bath. 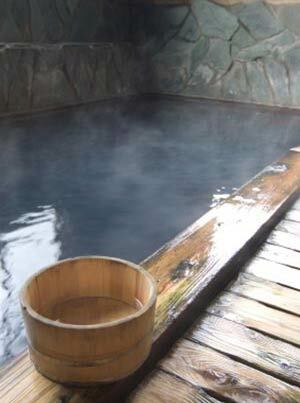 The word ofuro is the Japanese name for the bath tub itself. 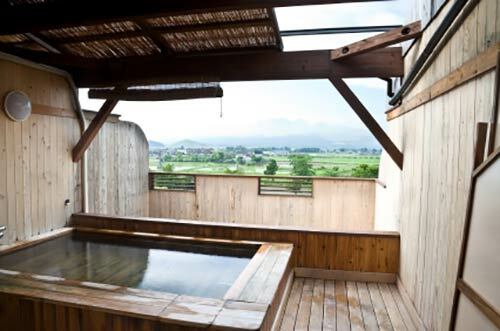 It is a compact, deep soaking tub, traditionally made from hinoki (Japanese Cypress). Japanese bathrooms are actually wet rooms, consisting of a shower area and the tub. Where space is at a premium, the soaking tub gets a roll-away cover to stand on whilst doing the soaping and rinsing. Family members share the water in the tub, so no soaping or cleaning is done in the tub at all. The toilet and vanity will be housed separately. The shape and size of the Japanese soaking tub is ideally suited for a small bathroom. In a bigger master bathroom, you could create an island bath, a design trend that is very popular in contemporary bathrooms. Many companies manufacture tubs and sinks in hard-wearing wood such as teak and can custom make them to fit your Asian bathroom design and space. Tubs can have a seat (fixed or removable) and can be freestanding or placed on top of, or sunken within a platform. You can have so much fun with the design for the decking surround and steps. 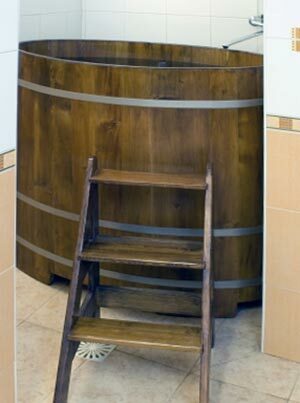 There's something extra special about wooden tubs. They are unique and relatively unknown to most westerners at this time, but they are gaining in popularity. Being a natural material, their look and feel and natural aroma cannot be replicated with a man-made material. However, the tub for your Japanese bathroom design can be constructed from any material and can take any shape: round, oval, rectangular etc. You could use traditional hinoki, your locally available hardwood, acrylics, stone, metal or concrete. It's the deep soaking experience and simplicity of form that we're looking for here, rather than a strict adherence to a specific material. Yes, in the purest traditional sense it would be constructed from wood, but in modern day Japan they are also using acrylics now. 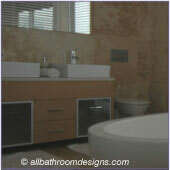 Creating a Japanese style bathroom does not mean you cannot use modern fixtures or fittings. Look for tubs, toilets, sinks etc. with clean and simple lines. That claw foot Victorian slipper bath is definitely not going to feel welcome in this setting. Minimum decorating objects or elements. For many westerners who want to have a Japanese styled bathroom, the allure may not necessarily be in the traditional bathing ritual, but rather in the Japanese design elements that epitomize simplicity of line, form and palette. 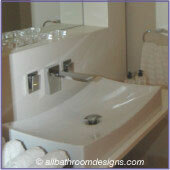 Visit our Japanese Bathroom page for more interpretations and design ideas.